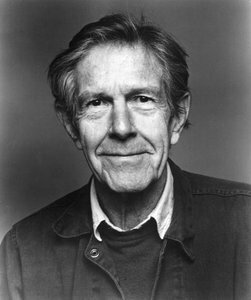 The term ‘Number Pieces’ refers to a body of late works by John Cage composed between 1987 and 1992. Each piece is named after the number of performers involved. One12 is the twelfth work in a series of works for a single performer and was written and performed by John Cage in 1992. The score is subtitled ‘for a lecturer’ and consists of a single page of handwritten instructions. Using Andrew Culver’s computerised version of the I Ching, 640 numbers are generated which the performer interprets as vowels, consonants or words. In this concert there will be two simultaneous performances of One12. Song Books (Solos for Voice 3–92) is a collection of short works composed and compiled by the composer in 1970. It contains pieces for voice and also for theatrical performance. Certain Solos consist only of instructions to the performer, ie. what he or she should do and how, although these instructions may be rather free. Tonight’s performances will be taken from works 26, 32, 46, 78, 88 and 89 and will take place throughout the evening. This evening, Cheap Imitation will be played simultaneously with One12: the first movement on piano, the second movement (which will slightly overlap the first) on vibraphone and the third (which will slightly overlap the second) on piano again. The form and content of Concert for Piano and Orchestra are indeterminate in that any complement, from solo to tutti, of the aggregate of thirteen individual players, plus piano and conductor, might play in a given performance. The elements for each instrument, which Cage developed based on the idiomatic (and certainly not limited to traditional) possibilities of the instrument learned from performers, frequently can’t be predicted exactly in their details of pitch, articulation, and dynamics. Dream (1948) was written for Merce Cunningham’s dance, using minimal fixed tones of sustained resonance in a simple rhythmic structure. For this performance, I have added notes to the repetitions of the piece (there are two), to lead from the sleepiness of Dream to the boisterous Dream On. Dream on is an improvisation on the final chords of Dream. In the spirit of Cage, there is a large measure of chance in the piece. I made a list of many of the patterns that Cage used in his piano music, especially Music of Changes. I also made a list of some sounds that can be made inside a piano. I gave each pattern a number and then used the number Pi to select which patterns to use. I then put the chosen patterns on a set of cards (one keyboard pattern and one string pattern). There are twelve cards. The audience will select the order in which I will ‘play’ the cards by throwing two dice. Once a card has been played, it can no longer be used. The piece will end when all of the cards have been used, but for no longer than ten minutes – theoretically, it could go on forever! Composed by Cage in 1952 as a graphic score and transcribed in 1958-9 by him for a 2- or 3-octave carillon (an instrument of cast bronze bells often housed in a church tower, operated by a keyboard), this piece started a series of Cage’s works for the instrument. Chance operations determined folding and cutting sheets of paper and their positioning, points were then inscribed through the cuts which determined notes – pitch vertically and timing horizontally. In the 2-octave version played tonight, the pitch was notated conventionally on the stave. The sound of a carillon is being simulated, as far as possible, on the vibraphone. Composed by John Cage in 1990, this is a work for solo percussion. The score consists of six time-brackets for the left hand and eight for the right, each containing a single sound. Dynamics and choice of instruments are free. Bram Stoker’s novel ‘Dracula’ was published in 1897 and tells the story of the vampire Count Dracula’s move from Transylvania to England so he may find new blood and spread the undead curse. The story is told as a series of letters, diary entries, ships’ log entries and phonograph recordings, whose narrators are the novel’s protagonists, and occasionally supplemented with newspaper clippings. This ‘Accompanied Reading’ presents some of the diary entries of Jonathan Harker – a solicitor who escaped from Dracula’s castle and now with his wife Mina and others led by Professor Abraham Van Helsing is on the trail of Dracula in Whitby and London. This is one of Cage’s earliest number pieces. 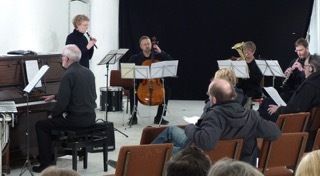 It is written for five performers. The instruments are unspecified, but pitches and dynamics are provided. Each part contains five time brackets, and each time bracket contains one, two or three sounds. Some successful ‘four-letter’ Americans: Vint Cerf (a ‘father of the internet’), Elon Musk (CEO of SpaceX, etc. ), John Cage (composer). 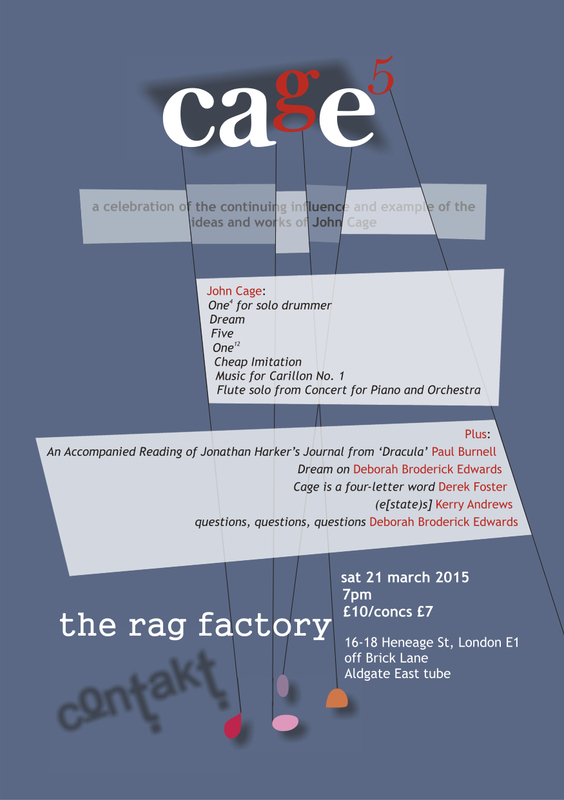 Cage as a ‘four-letter word’, a ‘bogeyman’: ‘Not a composer but an inventor of genius’ – Schoenberg; ‘A philosopher, not a composer’ – in essence what several critics have said. I have some sympathy with this, still holding to the (German?) ideal of musical argument, and feeling that its model of expectation and surprise, if missing, soon create boredom. Cage’s ‘I have nothing to say and I am saying it’ at first sight sounds like the pub bore. In my late teens I came across Cage, acquired a recording of his 25-year Retrospective Concert of 1958, and was fascinated. Cage was intent on creating sounds that ‘just are’, different Cage pieces create quite different situations, and his selection of material and application of chance are ‘composerly’. I wrote some ‘chance’ pieces in 1963, one of which, for piano, sees the light of day over 50 years later, incorporated into the first section of this piece; a similar newly composed one for oboe appears later. Otherwise, the notes and sounds of different sections were decided pre-composition by the performers, leaving me as composer at arm’s length. If I had any role, it was deciding on the sections and overall form, and using random processes to create patterns of the pre-selected notes and sounds. This piece uses 76 questions from Cage’s Silence. Ilze is a flutist based in London. She obtained her Bachelor and Master’s degree with professor Imants Sneibis at the Latvian Academy of Music. She continued her studies at the Royal Conservatory in The Hague under professor Thies Roorda and later moved to London where she received a S.S. Payne Award and Latvian Educational Foundation Scholarship to study for a Postgraduate Diploma at the Royal Academy of Music. 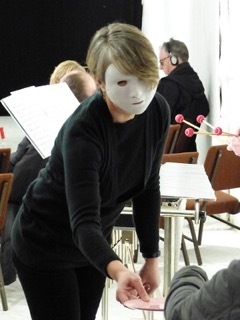 Ilze has a special interest in contemporary music and has worked with many young composers as well as with the renowned Distractfold Ensemble, Dr. K and Clapton Ensemble. Ilze’s recent performances have taken her to the Royal Festival Hall, the Barbican Hall, St. James’ Church, Piccadilly, The Forge, Grimeborne Opera Festival, Rough for Opera and Dinefwr Literature Festival as well as venues in France, Sweden and Spain.